Preface: Eavan Boland, Director of the Creative Writing Program, introduced Pinsky, saying that he'll be glad to answer questions as well showing some videos of his Favorite Poems Project. Most of the students in Pinsky's Poetry Workshop are not here today, probably because of their other classes and preparation for the coming week's final exams and papers. However, three of my friends from Foothill College are here to enjoy Pinsky's presentation, as well as a packed house of poetry lovers. Here are my notes of Pinsky's Colloquium with dates in brackets and web links added. The comments by the people reading their favorite poems are from Pinsky and Dietz, An Invitation to Poetry (2004) as well as the poems themselves (with page numbers). They are also available at Pinsky's Favorite Poem Project web site. 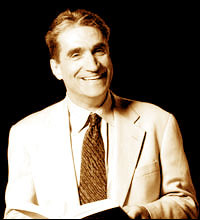 Robert Pinsky: This "Favorite Poems" project began when I was the U.S. Poet Laureate [1997-2000]. The poet laureates before me Rita Dove [1993-1995] is known for her poems on inner cities. Robert Hass [1995-1997] is known for his poem on ecology. Rita was black, Bob was green. I wasn't interested in doing poems about a Jewish guy from New Jersey. My ad budget was $9. I asked ordinary people to send in their favorite poems. We received 10,000 letters. The three Anthologies grew out of this (www.favoritepoem.org). We had a poetry reading at the White House [April 22, 1998]. President Clinton read Emerson's "Concord Hymn". Hillary read Howard Nemerov's "The Makers". There was a young student in a wheelchair [Jessie Alpaugh, Berkeley, CA] who read Robert Frost's "Stopping by Woods on a Snowy Evening " with a resounding voice "And I have miles to go before I sleep." Americans are not yahoos. They can tell about art and what they love. In Europe, when they get mad at someone, they yell out "You have no culture!" We don't have snob values in America. We are what we are. The medium for poetry is not words or images. The medium of poetry is our human body. Medium is your breath. Imagery of the poem is your voice on an individual human scale. By its nature, poetry is a medium on an intimate human scale. It's a counterbalance to digital media, performances, dance, and athletics. John Doherty, [34, construction worker, Boston Gas Company, Braintree, MA]: Song of Myself is a poem that I probably had a lot of difficulty understanding the first time. There were certain lines that caught me and that I liked, and when I got to the very end of this very long poem the last half-dozen lines are so encouraging. In those last few lines Whitman tells you what you're thinking. He says, "You probably don't understand what you just read but stay with it and you will and you'll love it." That felt like it was speaking directly to me when I first read it, and I keep those lines in mind no matter what I read now. but I know it is in me. I sleep I sleep long. It is not in any dictionary or utterance or symbol. Perhaps I might tell more Outlines! it is eternal life it is happiness. Pov Chin [16, student, Stockton, CA]: I walk around with a smile on my face at school and with friends, but I still have different thoughts running through my head. It's never stable, it's always going. My parents are originally from Cambodia, but I wasn't born in Cambodia; I was born in Thailand, because they were having this genocide Pol Pot was killing Cambodian people. My parents thought: they can't they're not going to give up (that's where I learned never to give up), they're going to get out, they're going to escape for their lives... And we were lucky, we had family here already and so they helped us get to America. I feel guilty that, hey, I'm here free and I'm better off than a lot of people in Cambodia a feeling I'm not free to let out. And that's what Langston Hughes was saying. Pinsky: President Clinton gave $500,000 for this "Favorite Poem" video project. We made 50 short video documentaries of ordinary Americans reading and speaking personally about poems they love. We covered most of the East Coast, Connecticut, New York, Maryland, Virginia. But we didn't have enough money to do the middle of the country. The video you're going to see is about experiencing anxiety of city life in America, the tabloidization of culture. Richard Samuel [48, Glassblower, Seattle, WA]: I first encountered this poem in college in a poetry appreciation class. In college, most people feel that their life is a little bit out of control and the voice in this poem is someone who is very definitely out of control. There's a lot of poetry that talks about how stable and wonderful life is, and "the flowers are blooming." This poem is from the opposite end of that spectrum. I think that appealed to me as a college student facing the future and not sure whether I was going to be racing, like the poet, or going into the garden, as it were. Q: How do you write a Pinsky poem? A: I play around with consonants and vowels. It's not an encapsulated process. not thinking of rapture (?). Shifting of syllables and consonants. scan and dance if it's too rich, dilute it a bit. "Lana has collapsed... There is no snow in Hollywood." Writing is like playing at a piano. did you learn of any new poets? [52, Anestesiologist, Auburn, CA] brought him to my attention. to every English teacher in America to introduce poetry in the classroom. Seph Rodney [28, Photographer, Santa Monica, CA]: It was a date situation. I had wanted to go out with this girl and I just ended up feeling very bad at the end of it. It just didn't work out the way I wanted it to. I ended up feeling kind of lonely and "bereft" I suppose. I came home and I opened this book and I read some of the poems. Up until that point I think my sense of poetry is that it was a sort of grandiose, highfalutin, not very real way of using language. And I looked at this stuff and I could not believe it. It was light-years beyond anything else I had ever read. It was powerful, it was rough, it was bitter, it was caustic. It was, at the same time, really urgent about a need for love. Q (Ken Fields): How did you select these beautiful poeple? Pinsky: These people became beautiful when they read their favorite poems. Q: Did you experience diagramming sentences in school? A: Melody is in the syntax. Poetry is in the lines. Poem imitates movement in syntax. They belong together. Q: Where are people exposed to poetry today? in the MFA program at UCLA. We rely on schools to introduce poetry to students. didn't know that miners used blue light. These people need schools. "They rounded us up. She's with two worlds [Orient and the Occident]. Q: Is diagramming sentences useful in learning about poetry? the subject "Me" is referring to? If you say "entombs", you get an "A". Q: I've written grammars for computers. It came out with the wrong results. A: Cynthia Bruegil (? ), a teacher, said, "I learn grammar from reading literature." Q: Can young kids learn from poetry jams, slams? A: I find it boring. Russell Simmons Def Poetry Jam does not excite me. It's cornball. I rather write than perform poetry. Q: Is your writing like fast food or slow cooking? A: My process of writing. I get up early. Easy for me to put clay on the table. Refinement of the poem can take days, weeks, months. Each poem is different. Q: Do you look back at drafts? A: Like tools or scaffold. Once you're finished, don't look back at it anymore. Yina Liang [16, Student, Atlanta, GA]: I discovered this poem in seventh grade when one of my English teachers showed it to me. And ten eigth grade came and ninth grade, and every year as life gets busier the poem keeps on coming back to me... so much better each time, that I think in time it discovered me. Emily Dickinson, "I'm Nobody! Who Are You?" Don't tell! they'd advertise you know! How dreary to be Somebody! Kiyoshi Houston [14, Student, Santa Monica, CA]: I love watching the sunset on the beach. We live right next to the beach and I can just walk out there some nights and watch it. Or we'll be driving and I'll look out the window and there's always purple or orange or some wonderful combination of colors that sets me in awe. Afterword: The colloquium ended at 11:55 am. Lunch was served in the patio. I had potato salad, ham sandwich, fresh fruits of strawberries, blueberries, red grapes, and cantaloupes, with mango & passion fruit juice drink. My colleague Bill Morrison from Foothill College is here. He's excited that Pinsky signed his four books. 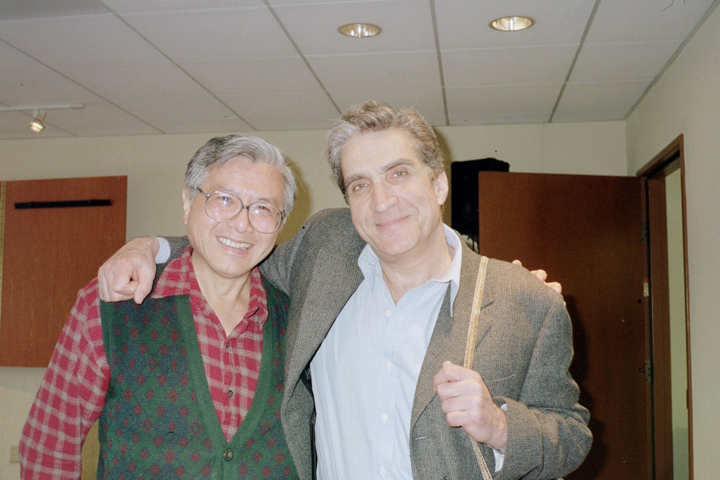 When he showed me Robert Pinsky's autographs, I wrote this haiku: Bill shows me Pinsky's / autograph big R and P / so round, so open! I asked Rudy to order Pinsky's The Figured Wheel: New & Collected Poems 1966-1996 last Thursday for me from Amazon, but it didn't arrive yet [it came on March 8 when Pinsky returned to Boston, so I missed getting his autograph]. Bill asked Pinsky whether it's too late for a 83-year old man to learn poetry. Pinksy told him, "It's never too late for poetry." Pinsky was surrounded by many well-wishers and autograph seekers for his books. When he was about to leave the Terrace Room, I requested a photograph with him. Pinsky was happy to oblige, and I'm glad it came out well with both of us smiling. This is a beautiful momento of the wonderful time spent this semester in his Poetry Workshop at Stanford where I learned so much from him on poetry and the craft of writing.